SLE poses formidable therapeutic challenges due to its heterogeneity and treatment decisions often cannot be guided by data of high quality. In this review, we attempt to provide insights regarding the treatment of SLE in everyday clinical practice, based on contemporary evidence and our own personal experience. We focus on common therapeutic issues and dilemmas arising in routine care, including monitoring for retinal toxicity associated with hydroxychloroquine, handling of glucocorticoid regimens in order to minimise their adverse events, choice of immunosuppressive medications based on prevailing disease manifestations and optimal use of available biological agents (belimumab and rituximab). We also provide our view on the position of calcineurin inhibitors in the management of lupus nephritis and conclude with remarks on the future perspectives for this challenging disease. SLE is a notoriously heterogeneous disease with protean manifestations of varying severity. 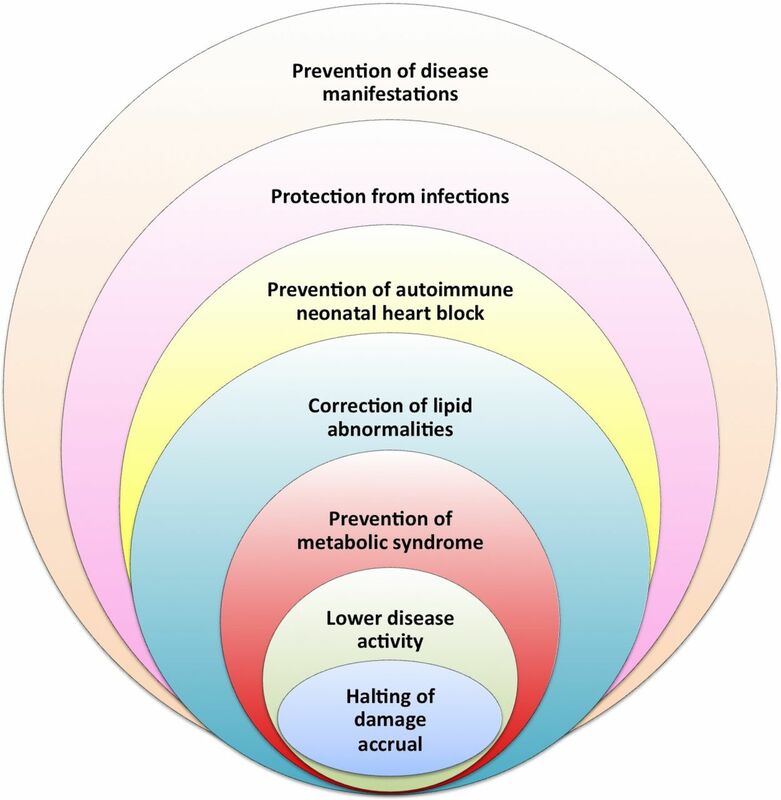 The recently introduced ‘treat-to-target’ approach in the management of the disease has emphasised minimisation of disease activity as a principle goal of therapy9; however, the variable responses of different organ manifestations to the same IS agents render a ‘one size fits all’ approach practically impossible. While appreciating this reality, in this review we attempt to provide practical recommendations for the management of lupus based on existing evidence and personal experience. We do not attempt to give an exhaustive guidance on all disease manifestations; rather, we focus on common therapeutic issues arising in routine care, such as handling of frequently used medications, choice of drugs based on prevailing disease manifestations and use of biological agents. The multiple therapeutic benefits of hydroxychloroquine in lupus. To further complicate matters, the recent development of advanced, more sensitive screening techniques for the detection of HCQ-induced retinal toxicity (eg, 10-2 visual fields, spectral domain-optical coherence tomography) suggests that the latter may be more prevalent than previously believed, reaching 10% or more among long-term users.23 24 A daily dose of >5 mg/kg real weight and a duration of use of more than 5 and, especially, more than 10 years, are particularly associated with heightened risk of retinal toxicity.24 Patients with chronic kidney disease and pre-existing retinal or macular abnormalities comprise a particularly high-risk group. Considering that, (1) recent data were based on prescription practices rather than actual blood concentrations, (2) drug adherence rates are consistently suboptimal in all studies, and (3) SLE is a chronic disease affecting predominantly young individuals, one could be concerned that physician efforts to improve patient compliance rates in the future may have to come at the expense of increased ocular toxicity. Where do the above data leave us? Undoubtedly, HCQ is indispensable for the treatment of SLE, but a certain degree of caution is needed. The recommended daily dose should not exceed 5 mg/kg real body weight and periodic eye examination (baseline, after 5 years and yearly thereafter, in the absence of retinal findings) should no more be performed by funduscopy, rather by one of the newer screening techniques recommended by the American Academy of Ophthalmology.25 Of note, the comparative efficacy of lower HCQ doses in terms of disease control and prevention of relapses will have to be tested in practice, as all published trials have used the previously common 6.5 mg/kg target dose. In our practice, we also attempt to reduce to a maintenance dose of 200 mg/day in patients with persistent low disease activity (LDA) or remission, although no robust data exist to substantiate this practice. Measuring HCQ concentrations can be helpful to detect complete non-adherence, but more data are needed regarding concentration-adjusted dosing, owing also to its limited availability. Finally, especially in patients with skin manifestations, quinacrine may be used as an alternative antimalarial, given its reported efficacy in cutaneous lupus erythematosus. To this end, a randomised trial comparing standard versus lower GC doses would be welcome in SLE. This pending, there is evidence—and a firm belief in the community—that GC use in lupus should be rationalised towards lower cumulative doses in the long term. GC provide rapid symptom relief, cannot be avoided in moderate-severe disease and can even be life-saving in life-threatening cases; however, following the acute phase, they should be lowered to maintenance doses, and ideally discontinued, as soon as possible. In this regard, we believe that the use of intravenous MP pulses (eg, 250–1000 mg/day for 1–3 days, reserving the highest doses for the most severe disease manifestations, and always taking into consideration the risk for infectious complications) enables for a lower starting oral dose. By using this practice, we rarely start prednisone at a dose higher than 0.5–0.6 mg/kg/day, which is followed by a rigorous effort to reduce to a safe maintenance dose within 4–6 months. Regarding the latter, although most reports have used 7.5 mg/day as a cut-off, above which the risk for damage accrual increases considerably,33 34 even lower daily doses (4.4–6 mg/day) have been associated with a significantly increased risk in individual studies.8 35 It would be prudent to recommend that treating physicians should aim at the lowest possible dose of prednisone, and by no means more than 7.5 g/day after 6 months. 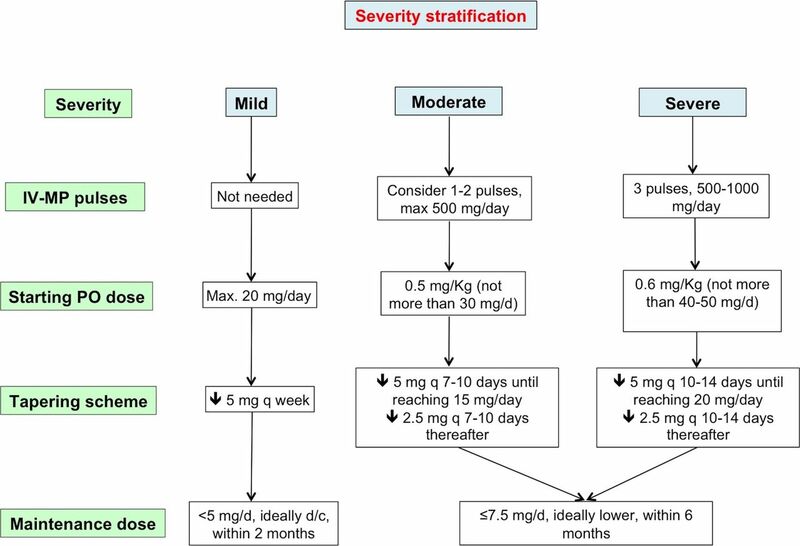 This recommended approach for the handling of GC therapy in patients with SLE is depicted in figure 2. 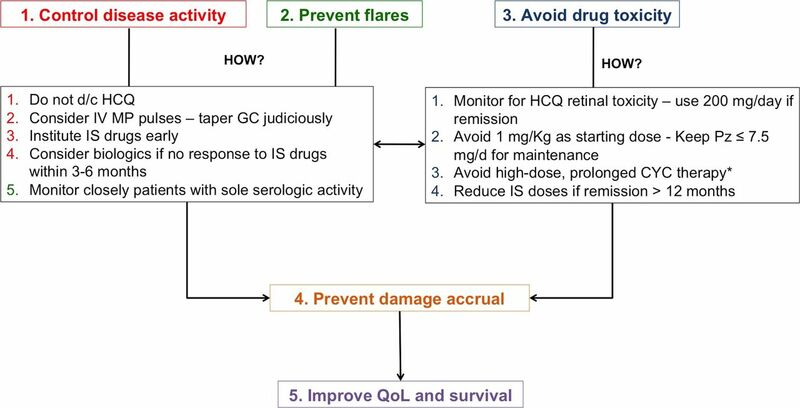 A proposed algorithm for the handling of glucocorticoid (GC) therapy in patients with active or flaring SLE. Mild: presence of only BILAG C or ≤1 BILAG B manifestation or physician global assessment (0–3) ≤1. Moderate: presence of ≥2 BILAG B manifestations or physician global assessment (0–3) 1–2. Severe: presence of ≥1 BILAG A manifestations or physician global assessment (0–3) ≥2. BILAG, British Isles Lupus Assessment Group; d/c, discontinue; IV-MP, intravenous methylprednisolone. Choice of the optimal IS agent: still a ‘trial and error’ approach in extrarenal disease? Next to HCQ, conventional IS drugs are most valuable in the therapeutic armamentarium of SLE; along with their immunomodulatory properties, they also allow for a more rapid and successful tapering of GC dose. Nevertheless, among patients with non-renal disease, the choice of the IS drug is largely empirical, since controlled studies between different IS drugs are limited. Moreover, SLE is a highly heterogeneous disease, often multisystem but occasionally organ dominant, and the various drugs may show different efficacy in the different organ manifestations. Trials in extrarenal SLE inevitably tend to group all patients together, however not all disease manifestations will respond equally to a given therapeutic regimen. In this context, a recent randomised study compared mycophenolate sodium (MPS) and azathioprine (AZA), in combination with GC (starting dose 20–30 mg/day in both groups) and antimalarials, in 240 Caucasian patients with SLE without renal involvement. Most patients had musculoskeletal and mucocutaneous manifestations, but almost 30% also had cardiorespiratory disease.36 The primary endpoint of the study was the rate of remission (measured by SLE Disease Activity Index 2000 (SLEDAI-2K) and British Isles Lupus Assessment Group (BILAG)) at 3 and 24 months and the results were remarkably in favour of the MPS arm; 71.2% of patients reached a clinical SLEDAI=0 at 24 months as compared with 48.3% in the AZA group. MPS also reduced the occurrence of flares more than AZA (71.7% vs 50% for BILAG A or B flares), without excess toxicity. Two earlier randomised controlled trials (RCT) had shown no significant difference between AZA and cyclosporine A (CsA) and between MMF and CYC, respectively (the latter was a post hoc analysis regarding extrarenal manifestations of the Aspreva Lupus Management Study in LN).37 38 Observational studies regarding the efficacy of the various IS drugs in extrarenal disease have been published,39 40 but these results are not always easy to generalise. Ultimately, the choice of the suitable IS drug for a given patient will depend on the severity of the disease, the prevailing organ manifestations, patient age and childbearing potential (including possible wish for pregnancy) and physician experience. More important than the choice of a specific drug (see also below, strategy for treating SLE) is the realisation that initiation of an IS drug should have a low threshold in a newly diagnosed patient, in order to pursue prevention of flares and avoidance of long-term GC treatment. In our practice, we tend to use IS early in the disease course, that is, from the first severe or the second mild/moderate flare. Drugs we use most commonly as first-line GC-sparing agents are MMF, AZA and methotrexate (MTX). Given the results of the aforementioned RCT, MMF may work better especially in cases of multisystem disease. However, the choice should take into account its higher cost and absolute contraindication in pregnancy (MTX is also contraindicated); in most countries, prescription of MMF also requires approval from local drug regulatory agencies, a cumbersome procedure which may act as a deterrent for some physicians. In cases with a single dominant organ manifestation, there are no high-quality comparative data to guide therapeutic decisions (possibly with the exception of skin disease, where data on drug efficacy are extrapolated from studies in cutaneous lupus erythematosus). As an example, we favour MTX when arthritis and cutaneous involvement are the predominant manifestations, and AZA or CsA in haematological disease or when pregnancy is contemplated. We reserve CYC for severe, organ-threatening disease manifestations (particularly neuropsychiatric, renal), or as «rescue» therapy when other options have failed. The ‘two-phase’ paradigm, induction followed by long-term maintenance therapy, is generally considered the state-of-the-art approach to treating LN. A detailed presentation of LN treatment is beyond the scope of this review and can be found in relevant published recommendations.41 42 Briefly, IS agents considered as first-line choices for induction therapy are MMF and low-dose intravenous CYC (3 g total) for induction, followed by either MMF or AZA for the maintenance phase, all based on a number of RCTs conducted over the past decade.43–46 High-dose intravenous CYC (0.75–1 g/m2/month for 6 months) may also be considered if poor prognostic factors (impaired renal function or adverse histological findings) are present. The aforementioned studies have indeed provided significant insights in the treatment of renal involvement in lupus. However, enthusiasm is dampened by two important limitations: (1) an almost exclusive representation of Asian patients, and (2) their relatively short-term follow-up and lack of robust long-term renal outcomes. Additionally, long-term use of CNI raises the risk of well-known harms, such as metabolic disturbances and nephrotoxicity. For this reason, we reckon that, prior to a universal recommendation of CNI as first-line treatment in LN, these findings have to be corroborated in large, multiethnic randomised trials with a prolonged follow-up, as patients from different racial or ethnic backgrounds may respond variably to IS drugs.51 With current knowledge, we consider CNI for patients with proliferative or membranous LN who are refractory to initial treatment after 6–12 months, especially when proteinuria/nephrotic syndrome is the cardinal manifestation. In such cases, we typically add the CNI to MMF, rather than using CNI monotherapy52 (provided a well-controlled blood pressure, lack of significant renal fibrosis and a glomerular filtration rate >60 mL/min2). For refractory patients with predominant nephritic features, we favour the use of high-dose intravenous CYC or RTX (see also below) over CNI. Interestingly, a recent RCT in a paediatric population showed that a single RTX cycle was superior to TAC in preventing relapses, in children with GC-dependent nephrotic syndrome, although not in the context of SLE.53 In certain circumstances, a repeat kidney biopsy in patients not responding after 12 months of therapy may prove helpful to guide subsequent therapeutic decisions. Biological agents: what therapy and for whom? Following the successful RCTs leading to its approval, various observational studies have reported on the use of belimumab in real-life settings, and have provided evidence that the drug is efficacious in reducing disease activity and flare rate and permitting tapering of GC, while a halting of damage accrual was also shown in certain studies.54–56 Belimumab has thus established its position in the therapeutic armamentarium of SLE. This said, a reasonable question often arising in clinical practice is whether a particular patient profile exists, which will best benefit from belimumab treatment. Post hoc analyses from the phase 2 and the phase 3 BLISS (a study of Belimumab in Subjects with Systemic Lupus Erythematosus) trials have suggested that patients with serological activity at baseline (ie, elevated anti-dsDNA titres and/or low complement levels) show better responses to BlyS inhibition.57 58 Based on this finding, a subsequent prospective multicentre study in Italy included only patients who had hypocomplementaemia and high anti-dsDNA, to assess the real-life efficacy of the drug.55 We recently attempted to address this question in a multicentre cohort of patients with SLE who had received belimumab for ≥3 months. Interestingly, we found that, although serologically active patients did show more robust decreases in SLEDAI-2K with belimumab, the proportion of patients reaching remission or an LDA state over time did not differ between the two groups.59 Of note, complete remission (ie, clinical and serological, total SLEDAI=0) was actually more common in patients without serological activity at baseline, owing to the fact that C3/C4 and anti-dsDNA improved, but rarely completely normalised with belimumab treatment. The situation with RTX is somewhat different, because the latter is not approved for the treatment of SLE, following the unsuccessful Exploratory Phase II/III SLE Evaluation of Rituximab (EXPLORER) and LUpus Nephritis Assessment with Rituximab (LUNAR) trials.63 64 Despite the wealth of observational data in over 1000 patients reported in various studies,65–67 which have convinced the community for the efficacy of RTX in both renal and extrarenal lupus, its ‘off-label’ status—together with the cost—inevitably renders it a second-line treatment or, ideally, a ‘rescue’ therapy in difficult cases. Indeed, in certain manifestations, where several conventional IS drugs have failed to provide adequate disease control, RTX may prove very helpful. Such examples include autoimmune cytopenias, especially thrombocytopenia (CR rates up to 90%), inflammatory neuropsychiatric manifestations (CR 61%), proliferative LN (CR 51%) and, reasonably, arthritis resembling rheumatoid arthritis (RA).68–70 Especially in thrombocytopenia, we keep a low threshold to use RTX, following failure to or relapse after GC and—at least—one IS drug, given its established efficacy also in immune thrombocytopenia. Should RTX be given as monotherapy or together with a conventional IS drug? More importantly, should it be administered on a fixed ‘RA-like’ interval or ‘on demand’? Regarding the first question, no data support that combination of RTX with any particular IS has better efficacy than RTX monotherapy. Indeed, while early studies tended to combine RTX with CYC, especially in refractory renal disease, in most recent reports RTX monotherapy has prevailed, owing to its more favourable safety profile and no difference in efficacy.67 69 The question of the optimal treatment regimen is more challenging; SLE per se may follow a more unpredictable course than RA and several observational studies have shown that the relapse rate following a first cycle of RTX treatment ranges from 20% to 67% (31% in one meta-analysis).71–73 More importantly, two retrospective observational studies suggested that time to flare may be significantly prolonged following the second versus the first RTX cycle.74 75 We nevertheless believe that data are not sufficient to recommend a fixed 6-month regimen in all patients, in an era of accumulating data regarding the effectiveness of tapering biological therapy in rheumatic diseases.76 We decide on the treating regimen on an individualised basis, with the majority of patients treated ‘on demand’; in responders and patients who have reached LDA, low-dose retreatment (eg, 1 g) in longer intervals (eg, 8 months) also sounds reasonable, although no studies have formally tested this practice. Table 1 summarises the key points regarding the use of belimumab and RTX in SLE. Treatment targets in SLE and how to achieve them: a matter of specific drugs or a strategy? The inter-relationship between goals of treatment in SLE and a proposed strategy to meet them. CYC, cyclophosphamide; d/c, discontinue; GC, glucocorticoids; HCQ, hydroxychloroquine; IS, immunosuppressive; IV MP, intravenous methylprednisolone; Pz, prednisone; QoL, quality of life. It is becoming clear that, more than focusing on specific drugs to treat different organ manifestation, the above goals are best aimed for, through a strategic plan tailored to each patient. This strategy has to take into consideration patient preferences, age and childbearing potential, safety and cost issues of available drugs. Key features of this strategy would typically include continuation of HCQ at all times (no evidence of toxicity provided), a dedicated effort to keep daily GC dose to an acceptable level through early initiation of IS agents and use of intravenous MP pulses, as well as reduction of drug doses in the long term (figure 3). In addition to trial design, to provide evidence-based guidance to physicians and improve patient outcomes, future advances would include, but not be limited to: (1) definition of a universally accepted level of minimal disease activity, if remission is unachievable, (2) real-life trials comparing low versus traditional GC regimens, as well as different IS drugs for similar manifestations, (3) prospective studies exploring optimal duration of treatment and opportunities for drug discontinuation and, finally, (4) research on biomarkers and prognostic factors related to response to different therapies. Given the productivity of research in the field, we are looking forward to exciting news for patients with lupus.
. From childhood to adulthood: the trajectory of damage in patients with juvenile-onset systemic lupus erythematosus. Arthritis Care Res 2017;69:1627–35.
. Efficacy and safety of off-label use of rituximab in refractory lupus: data from the Italian multicentre registry. Clin Exp Rheumatol 2015;33:449–56. Contributors AF reviewed the literature, drafted and reviewed the manuscript. GB supervised, edited and reviewed the manuscript. Both authors approved the final form of the manuscript.